and Where the Visitor Wants Us To Be’! As one of the premiere distribution rack systems of the Gulf Coast for the past 16 years, we are here to distribute your advertising materials on our rack system. We have expanded the number of quality rack sites and have new regions for you to consider! *** There are larger custom packages which we can discuss with you. Navarre can be added as a special feature. 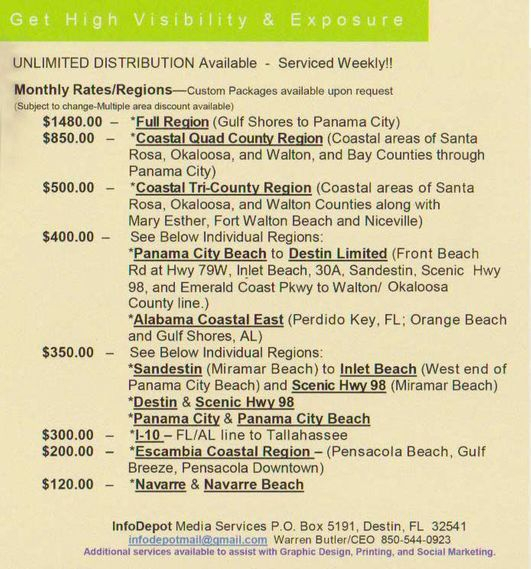 Pensacola, Gulf Shores and Orange Beach can be added or a special sectional area. Please let us know how far you wish your advertising to venture out into the regions. Thank you! We Appreciate Your Business Very Much! Talk to you soon!